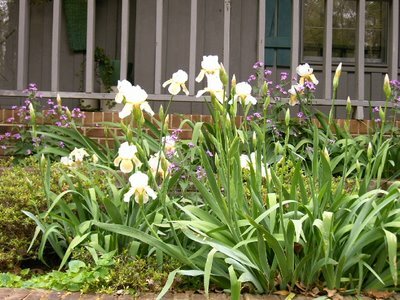 but I did say I'd show you the rest of the irises when they bloomed. The blooms are heavy, so at least 5-6 stems of them have fallen over and are laying on the azaleas behind them. Yesterday, my neighbor called and asked me to come over and see her yard. It is a showplace, and should be in a magazine. I would estimate at least 500 tulips in full bloom over there, and such blooms we have seldom seen outside of Holland! They are huge blossoms (about 3 1/2-4") and they stand about 2 feet tall. She gave me an armload of them, and now their orange and yellow blooms grace my living room and kitchen. It is too bad I didn't get to take a photo of them for you. I'll have to do that next year. Tomorrow, their tulips (which are only beginning to show signs of aging) will be ripped out of the soil and replaced with something just entering its prime (usually begonias). It is nice to live near such beautiful displays, but it puts a lot of pressure on a non-gardener, like I am! You are much more a gardener than I am. My neighbors on either side have beautiful gardens. I just enjoy them., Every once in a while I remind them to weed! I LOVE spring flowers. I love tulips and daffodils. My Grandmother used to have a garden full of daffodils. All shapes, sizes and colors. I loooove irises. They won't be in bloom up here though for several more weeks. Wow. Praise like that coming from a florist tells me that those must be SOME TULIPS indeed! Get any pictures? Tulips are my favorite flower, all time. I saw a listing in the paper recently of all the tulip festivals around here. I'd love to take one in this weekend. I appreciate the beauty of flowers. It doesn't matter if your garden is inferior to the neighbors or not. Flowers are so beautiful. Tulips are a spectacular flower. One of my favorites. beautiful flowers.. thank you for sharing.. They're not so bad, most people are better gardeners than they think! Here from Michele's today. So pretty. Our irises don't appear here in the NE until summertime, so I'll admire yours while I wait! Wow, great post title. Wel, for me it is. One of my favorite songs by Kathi Burg is called that. Which reminds me, I still need to write that review I prommised. Anyway, be thankful you have a garden and are around such beautiful flowers (even if they are not yours) because city life is no picnic. At least my condo complex is landscaped well. well you may be a non-gardener, but you must be doing something right beause they sure are pretty! Wow! At least you have flowers...it's way too early here in Colorado. Michele sent me! Nice gardening touch you have. Would love to have seen these tulips in the ground or even in your house! How wonderful that you have such a prolific gardener for a neighbor, Judy! The Irses look very beautiful, btw! Our irises are not doing much yet. Mom was looking at something on TV today, 30 giant buttercups? or something. Dad and I just shook our heads. We just finished putting in the 24, 4 o'clocks.... now 30? I don't think we can take it. I want to plant some sunflowers. I love tulips.. sigh..such a pretty romantic flower..hope you enjoy them! My favorite flowers are Iris, but it will be awhile before they bloom here. I was gifted with some rhisomes from friends and should have a nice show later. Your border is charming! Nice blog! I'm glad I dropped by. Your blog will NOT be listed as something anyone hates! Thankyou for sharing these gorgeous photos. I have agggges to go before there's any sign of tulips here so your pictures were very much appreciated! The Irises are wonderful. Nice work, Judy! Five hundred tulips? Holy mackeral!